Today we are going to analyze the second part of the "Our Father", the one in which we present our needs to God. This second part begins with a word that smells of everyday life: bread. Jesus' prayer starts from a compelling question, which is very similar to the begging of a beggar: "Give us our daily bread!" This prayer comes from an evidence that we often forget, which is to say that we are not self-sufficient creatures, and that we need to feed ourselves every day. The Scriptures show us that for so many people the encounter with Jesus was realized starting from a question. Jesus does not ask for refined invocations, on the contrary, all human existence, with its most concrete and daily problems, can become prayer. In the Gospels we find a multitude of beggars who beg for liberation and salvation. Who asks for bread, who heals her; some purification, others sight; or that a loved one can live again ... Jesus never passes indifferent next to these requests and these pains. Therefore, Jesus teaches us to ask the Father for daily bread. And it teaches us to do it together with so many men and women for whom this prayer is a cry - often kept inside - that accompanies everyday anxiety. How many mothers and fathers, even today, go to sleep with the torment of not having enough bread tomorrow for their children! We imagine this prayer recited not in the security of a comfortable apartment, but in the precariousness of a room in which we adapt, where there is not enough to live. The words of Jesus take on new strength. Christian prayer begins at this level. It is not an exercise for ascetics; it starts from reality, from the heart and flesh of people who live in need, or who share the condition of those who do not have the necessary to live. Not even the highest Christian mystics can disregard the simplicity of this question. "Father, let there be the necessary bread for us and for everyone". And "bread" is also for water, medicine, home, work ... Ask for what is necessary to live. The bread that the Christian asks for in prayer is not "mine" but "our" bread. This is what Jesus wants. He teaches us to ask for it not only for ourselves, but for the whole fraternity of the world. If we do not pray in this way, the "Our Father" ceases to be a Christian prayer. If God is our Father, how can we present ourselves to Him without taking our hands? All of us. And if the bread that He gives us we steal from us, how can we tell ourselves his children? This prayer contains an attitude of empathy, an attitude of solidarity. In my hunger I feel the hunger of the multitudes, and then I will pray to God until their request is granted. Thus Jesus educates his community, his Church, to bring the needs of all to God: "We are all your children, Father, have mercy on us!" And now it's good for us to stop a bit and think about hungry children. We think of the children who are in countries at war: the hungry children of Yemen, the hungry children in Syria, the hungry children in many countries where there is no bread, in South Sudan. We weigh these children and thinking of them together we say, aloud, the prayer: "Father, give us this day the daily bread". All together. The bread that we ask of the Lord in prayer is the same one that one day will accuse us. We will be reproached for the little habit of breaking it with those close to us, the little habit of sharing it. It was a bread given for humanity, and instead it was eaten only by someone: love cannot bear this. Our love cannot stand it; nor can the love of God bear this egoism of not sharing bread. Once upon a time there was a great crowd before Jesus; they were people who were hungry. Jesus asked if anyone had anything, and only one child was found willing to share his supply: five loaves and two fish. Jesus multiplied that generous gesture (see Jn 6: 9). That child had understood the lesson of the "Our Father": that food is not private property - let's put this in mind: food is not private property - but providence to share, with the grace of God. The true miracle performed by Jesus that day is not so much the multiplication - which is true - but sharing: you give what you have and I will perform the miracle. He himself, multiplying that offered bread, anticipated the offering of Himself in the Eucharistic Bread. In fact, only the Eucharist is able to satiate the hunger for the infinite and the desire of God that animates every man, even in the search for daily bread. I greet the English-speaking pilgrims and visitors taking part in today’s Audience, especially those from England, Ireland, Denmark, Japan and the United States of America. May the Lenten journey bring us to Easter with hearts purified and renewed by the grace of the Holy Spirit. Upon you, and your families, I invoke joy and peace in Christ our Redeemer! Herzlich grüße ich die Brüder und Schwestern deutscher Sprache. Wir sind alle Kinder des Vaters im Himmel, der uns sieht und sich um uns kümmert. Dies schafft eine Gemeinschaft unter uns und ein Miteinanderteilen. Wir sind daher eingeladen, von diesen Gaben denen zu geben, die es brauchen und in Not sind. Ich wünsche euch allen einen guten Aufenthalt in Rom und eine gesegnete Fastenzeit. Dirijo uma cordial saudação aos peregrinos de língua portuguesa, em particular aos participantes no Convénio organizado pelo Instituto Sílvio Meira, aos alunos e professores do Instituto Nun’Álvares e aos fiéis de Cascavel e Hamilton no Canadá, encorajando todos a ser testemunhas do amor que Jesus nos demonstrou com o seu sacrifício na Cruz. Que a cruz seja o sinal duma vida de jubilosa doação ao próximo. De bom grado vos abençoo a vós e aos vossos entes queridos! أُرحّبُ بالحجّاجِ الناطقينَ باللّغةِ العربيّة، وخاصةً بالقادمينَ من الشرق الأوسط. أيّها الإخوةُ والأخواتُ الأعزّاء، في بساطتها وجوهريّتها تربّي "صلاة الأبانا" من يصلّيها على عدم الإكثار في الكلام لأنَّ – وكما يقول لنا يسوع – "أَباكُم يَعلَمُ ما تَحتاجونَ إِلَيه قبلَ أَن تَسأَلوه"؛ لذلك فالخطوة الأولى للصلاة هي أن نسلِّم أنفسنا لله ولعنايته وطلباتنا تعبّر عن الثقة بالآب؛ وهذه الثقة بالذات تجعلنا نطلب ما نحن بحاجة إليه بدون قلق واضطراب. ليبارككم الرب! Serdecznie pozdrawiam polskich pielgrzymów. Jutro, w Ogrodach Watykańskich, zostanie posadzony dąb z polskich lasów, jako znak żywych i mocnych więzów pomiędzy Stolicą Apostolską i Polską, która sto lat temu odzyskała swoją niepodległość. Właśnie 30 marca 1919 roku Stolica Apostolska uznała wolną Rzeczpospolitą Polską, nawiązując potem relacje dyplomatyczne. To drzewko jest również symbolem zaangażowania Polski na rzecz ochrony środowiska naturalnego. Dziękując Bogu za dar wolności, módlmy się, aby zawsze była używana dla wzrostu duchowego, kulturalnego i socjalnego waszego Narodu i dla integralnego rozwoju każdej osoby. Niech Bóg wam błogosławi! As every year, next Friday and Saturday, we will meet for the traditional initiative: "24 hours for the Lord". Friday, at 5.00 pm, in the Vatican Basilica, I will celebrate the Penitential Liturgy. How significant it would be that even our churches, on this particular occasion, were open for a long time, to ask for God's mercy and welcome it in the Sacrament of Forgiveness. I am pleased to welcome the pilgrims from the Dioceses of Palermo and Piazza Armerina, with the Bishops Mons. Corrado Lorefice and Mons. Rosario Gisana; and the parish groups, in particular that of Chiusi Stazione, accompanied by the Bishop Mons. Stefano Manetti. I greet the United Movement of Employees 118 Sicily; the Free and Strong Association of Pontinia and the educational institutes, particularly those of Ladispoli, Fasano, Corropoli and Naples. May the visit to the Tombs of the Apostles be for all of you an opportunity to grow in the love of God and to let yourselves be transformed by divine grace, which is stronger than any sin. today we have the joy of having a person with us whom I wish to present to you. 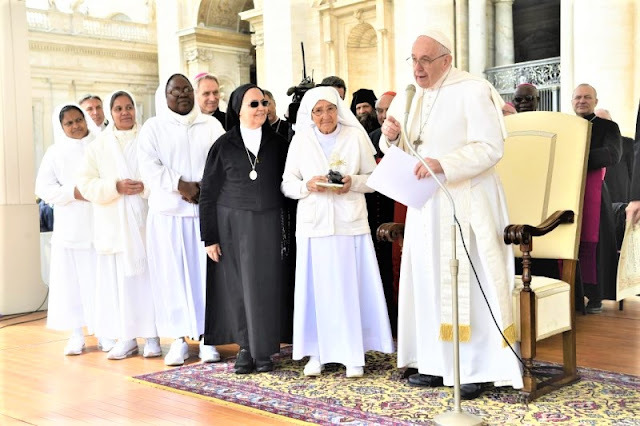 She is Sr. Maria Concetta Esu, of the Congregation of the Daughters of San Giuseppe di Genoni. And why do I do this? Sister Maria Concetta is 85 years old, and has been a missionary in Africa for almost 60 years, where she serves as a midwife. An applause. I met her in Bangui, when I went to open the Jubilee of Mercy. There she told me that in her life she helped thousands of children be born. Wonderful! Also that day she had come from the Congo in Canoa - at 85 - to go shopping in Bangui. In these days she came to Rome for a meeting with her sisters, and today she came to the audience with her Superior. So I thought I'd take this opportunity to give her a sign of gratitude and say a big thank you for her testimony! Dear Sister, on my behalf and on behalf of the Church, I offer you an honor. It is a sign of our affection and of our "thank you" for all the work you have done among African sisters and brothers, in the service of life, of children, mothers and families. With this gesture dedicated to you, I also intend to express my gratitude to all the missionaries, priests, religious and laity, who spread the seed of the Kingdom of God in every part of the world. Your work, dear missionaries, is great. You "burn" your life sowing the word of God with your testimony ... And in this world you do not make news. You are not news in the newspapers. Cardinal Hummes, who is in charge of the Brazilian episcopate, from all of Amazonia, often visits the cities and villages of the Amazon. And every time he arrives there - he told me himself - he goes to the cemetery and visits the tombs of the missionaries; so many young deaths for diseases against which they do not have antibodies. And he told me: "All of these deserve to be canonized", because they "burned" life in the service. Dear brothers and sisters, Sister Maria Concetta, after this commitment, will return to Africa these days. Let us accompany it with prayer. And his example helps us all to live the Gospel where we are. Thanks sister! The Lord bless you and Our Lady protect you.